OfficeR&D allows you to create, manage and send invoices. You can browse through all invoices or filter only the paid, overdue or failed invoices. You can also setup the system to automatically generate invoices or manually create new invoices or generate next month invoices. Navigate to the Billing module and select Invoices. To: select the member to whom the invoice should be issued to. This will include all fees and memberships in the product list of the invoice. Number: enter the number of the invoice. Note that this field is populated by default using the Invoice number template available under the Invoicing section in Settings. Issue Date: select the date of issue. Due Date: select the due date. Payment Method: select the payment method which you’d like to be recorded as part of the invoice payment terms. The following options are available: Auto, Cash, Bank Transfer and POS. Pay For: select which types of accountable items to be included in the invoice. OfficeR&D provides the option to issue an invoice for fees, memberships or for both. (Optional) Add additional services using the Add button available at the bottom of the dialog. Please note that those services will be included in the one-off fees revenue account by default (your revenue accounts can be found under Settings/Billing/Accounts). Click Add to create the invoice or click Add & Send to add the invoice and send it to a company email and/or a billing person. You can configure the email addresses where the invoice is sent to through the "Invoicing" section under Settings. 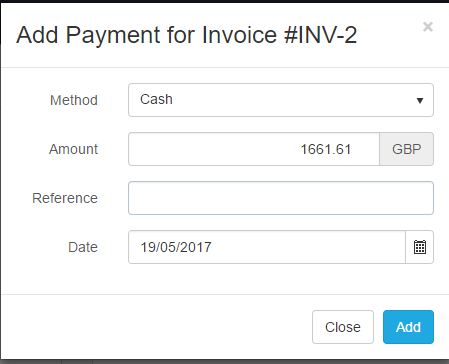 You can also set up automatic invoice sending following the steps described in the Automated invoice sending article. In order to manage the invoices, navigate to the Billing module and select Invoices. This will open a view with all invoices which you can filter by paid, overdue and failed invoices. Exporting and downloading an invoice. More information about that operation is available in Export Invoices. Send an invoice. The Send button will send the invoice to the billing person of the member to whom the invoice is issued. Void an invoice. When you mark an invoice as void, it will not be removed from the system but will be automatically excluded from all reports. Issue a credit note in the cases when you need to return the amount of an existing invoice to its owner. In order to issue a credit note, follow the How to issue a credit note tutorial. Delete an invoice. If an invoice is not paid or credited back, it can be deleted. However, note that deleting an invoice, removes it from the system and the invoicing sequence can be broken. Click on the Edit button. This will open the Edit Invoice dialog. *Discount: add a discount to the invoice. Edit the quantity and discount of the products included in the invoice. Sometimes you might need to manually enter a payment for an invoice. Click on the Add manual payment button. Select the payment method - Cash, Bank Transfer, POS, Cheque. (Optional) Under Reference enter the cheque reference number or another reference to the payment document. Enter the date of the payment operation. NOTE: If the payment is for the full amount of the invoice, the invoice will automatically be marked as paid. 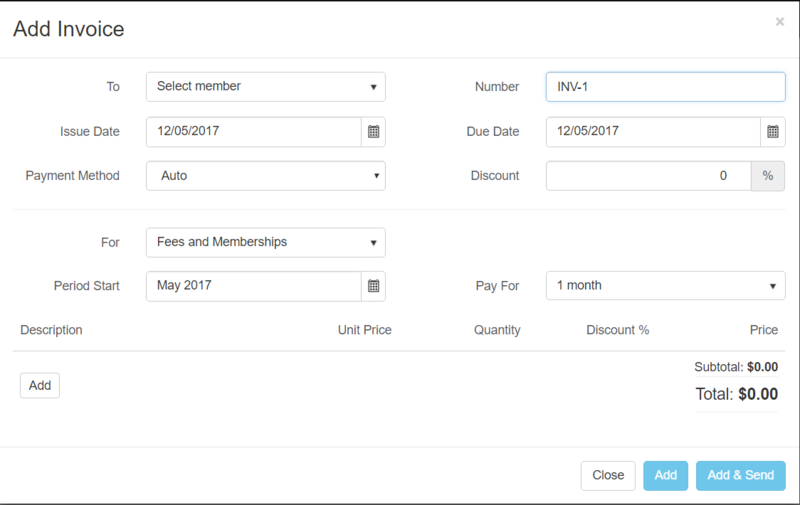 When the invoice is generated manually for multiple months and there are active memberships for the entire period, its period will match the selected time period. 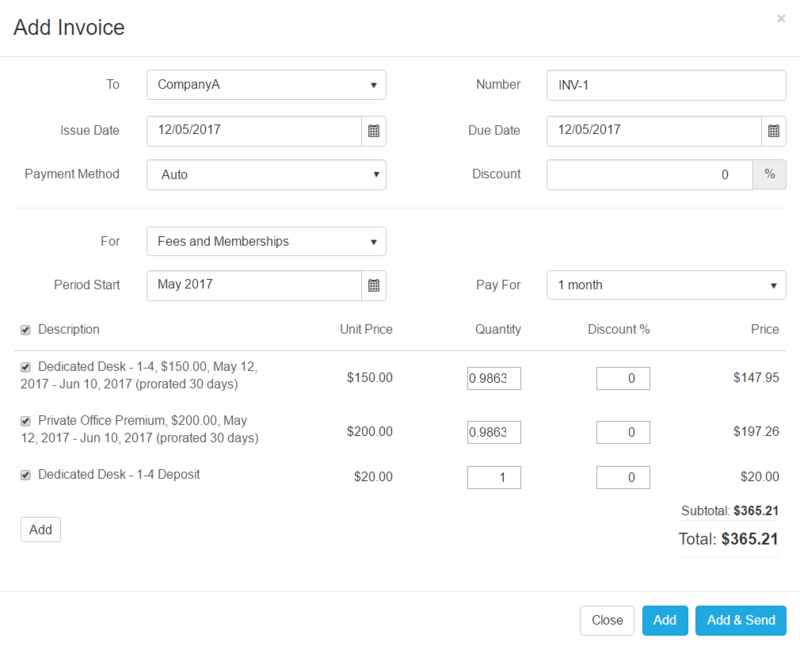 When the invoice contains only prorated memberships, the invoice period will not be the whole selected time range. For instance, if you bill from 1st of April 2019 until 30th April 2019 and have a membership ending on 15th of April 2019, the invoice period will be from 1st of April until 15th of April. If the invoice contains only one-off fees, the invoice period is the minimum period containing all one-off fees. For instance, if you have 2 fees in the invoice, one for 1st of April and one for 5th - the period will be from 1st of April until 5th of April.